Originally published in 1996, Drown by Junot Díaz is a book composed of ten short stories, some of them previously published in literary magazines and other venues. Junot Díaz won the 2008 Pulitzer Prize for Fiction and is better known for his work on the novel The Brief Wondrous Life of Oscar Wao. Born in the Dominican Republic and raised in the United States, Diaz follows in the footsteps of other Latin American writers with this collection of short stories. His voice is strong and he obviously knows the subject matter. In Drown, Díaz focuses on the struggles, frustrations, anger and needs faced by poor immigrant Dominican boys, young men, and adult males, both in the Dominican Republic and in New Jersey. And yes it's important to note that he does focus on the male experience and point of view. Some of the stories are connected and follow a family, a mother and two boys, from the Dominican Republic to New Jersey after their father sends for them: "Ysrael," "Fiesta 1980," "Aguantando," "Negocios." Other short stories are ambiguous in that the main characters are unnamed and could be attributed to other immigrant young men. "Aurora," "Drown," "Boyfriend," "Edison, New Jersey," "How to Date a Browngirl, Blackgirl, Whitegirl, or Halfie." and "No Face," in my opinion the weakest story of the bunch, is related to the short story Ysrael but only because the main character Ysrael is the central focus, but he is not related to the family in the story with that title. There are a couple of stories that really did it for me, but Drown is the one story that really grabbed me. The unnamed young man in this story avoids a childhood friend returning to the neighborhood, not only because of ambiguous sexual feelings, but also because he feels a failure. Díaz captures a sense of nostalgia and longing as the young man remembers his childhood days with his friend Beto, all mixed up with a sense of failure. The young man's sense of responsibility for a mother who is a ghost of herself, dreaming of being with a man who betrayed her, combined with his need to escape the neighborhood and feelings of entrapment are almost suffocating. Excellent. For the most part the short stories flowed to create a cohesive whole, although Díaz tended to go back and forth between the Dominican Republic and the US. The one story that really disrupted the flow for me was No Face. I think in this short story about Ysrael, Díaz failed to really touch the reader with this character -- at least he failed to touch me. I see the problem as one of misplacement. This short story really didn't seem to "belong" where it was placed for some reason, and it interrupted the flow of the book for me. Radically so. 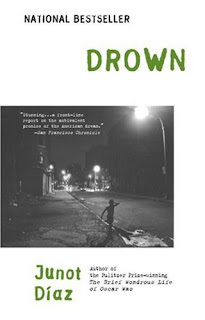 Although Drown is a collection of short stories that focuses on the Dominican immigrant's experience, I believe that these short stories also apply to the immigrant experience as a whole, and in that respect it is about immigrants and assimilation. He focuses those stories on how tough it is to emigrate and the difficulties faced while assimilating to a new culture for first and second generations, particularly when in many cases those immigrants wind up in ugly or pretty ghetto style neighborhoods. These neighborhoods are places that after a while those same immigrants can't seem to leave even as they dream of doing so. The claustrophobia of those places, the hold, the pitfalls, how the whole family can be affected, how the American dream can tarnish by desperation, poverty and poor, uneducated decisions. Díaz touches on all those points. However, he doesn't include success stories in this collection, at least his main characters are not a success. In that sense there is a lack of balance, but then I think that his purpose in Drown is to show the struggle and not necessarily the success. That lack of balance is also seen when it comes to the female's point of view, as females are portrayed from a distinct male perspective. They are portrayed as either women who somehow remain in a traditional female role even as they struggle against it, or women who are easily seduced. Females are often described as sexual objects or in sexual terms. I found it interesting that as the women aged in these stories they went from being highly sensual creatures who needed their husbands to protect them, to mothers who needed to be protected by their sons. In my opinion, a generalized machista and unrealistic portrayal of women as a whole. Even with the few problems I had with this book, I believe that for the most part Díaz achieved his goal and he did so with that strong voice I mentioned above. I read Drown for my internet book club, and the discussion was quite interesting. Most of us disagreed rather forcefully with Díaz's portrayal of women in this book. Others disagreed with what was seen as his negative portrayal of the Dominican immigrant and the lack of balance in his portrayal between the struggles and the success. Yet others disagreed that the collection could really be interpreted as the struggles of immigrants as a whole and that it should be seen as focused solely on the Dominican experience. Agree or disagree, reading and discussing Drown with a group was a wonderful experience. Publisher/Release Date: Riverhead/May 16, 2007 - Kindle Ed. Junot Díaz is a contemporary Dominican-American writer. He moved to the USA with his parents at age six, settling in New Jersey. Central to Díaz's work is the duality of the immigrant experience. He is the first Dominican-born man to become a major author in the United States. Díaz is creative writing professor at the Massachusetts Institute of Technology. He received the Pulitzer Prize for Fiction for his novel, The Brief Wondrous Life of Oscar Wao in 2008. He was selected as one of the 39 most important Latin American writers under the age of 39 by the Bogotá Book Capital of World and the Hay Festival. In September 2007, Miramax acquired the rights for a film adaptation of The Brief Wondrous Life of Oscar Wao. It definitely sounds like this book would provoke some great discussions. I'm sorry I haven't been joining in. One of these months I will! Christine, Drown was a great choice by the book club for discussion. Actually it was a good read all around, quite interesting and I enjoyed it. Me too! This is definitely a memorable book! This book is a most honest and basic portrayal of humanity. Diaz's language is simple yet beautiful, and his themes are universal yet deeply challenging. The book follows the lives of different people, mostly Dominican, but it's characters relate to the reader's most basic human soul in the same way that Holden Caulfield does. A Brilliant Work. Diaz doesn't show a balance between struggle and success immigrants stories because they simply don't exist. How many successful immigrants are there compared to those who have failed? There is no balance at all. And related to women, this is the reality they face in many countries including mine - Chile. Díaz just portraits a vivid reality we all know it happens yet. I have some questions about this can someone answer them? highlighting in these texts? What do you think is Yunior's relationship and history with Beto? are these tied to his ethnicity?